The Strike began at exactly midnight when a rowdy crowd of 200-300 demonstrators near Paris blocked the giant Rungis produce market (which replaced Les Halles, the legendary “Belly of Paris), cutting off food to the capital with trucks lining up outside. You can see the Yellow Vests among the Red flags of the CGT in this video from Le Parisien. (1) They even set up a barricade. In the early hours there were also blockages at the airport of Nantes and at the University there, at a key toll-gate near Toulouse, while in Grenoble transport was perturbed all morning. After shocking reports of police violence unleashed by Macron’s government against the Yellow Vests’ third Saturday demonstration, and in direct response to an appeal for calm from Macron, on Dec. 6, the leaders of the CGT and all the other labor federations except for Solidaires, signed a Déclaration of solidarity–not of solidarity with the injured and arrested demonstrators, but with the Macron government, the alleged representative of the “peaceful republican order!”(5) In return for what many described as a “betrayal,” the labor movement’s clique of professional negotiators accepted Macron’s invitation to “resume the social dialogue”–that is to allow them to sit at the table with him and negotiate more give-backs of workers’ rights. The union leadership’s pledge of allegiance to the neo-liberal flag did not go down well in the union ranks. And so the very next day, Martinez and the other union leaders spun in the wind like weathercocks, started acting militant, and called for a national labor demonstration (legal) on Fri. Dec 14. 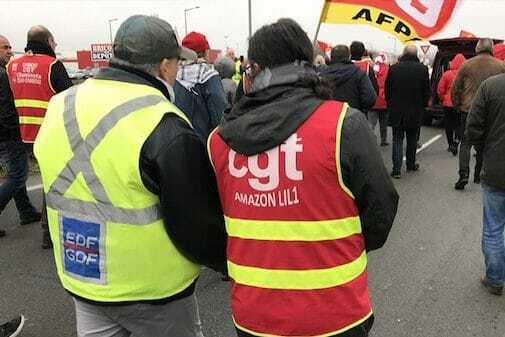 The union leaders’ strike demands covered the same basic economic demands as the Yellow Vests. The event was to be a demonstration of power, a public-relations leadership challenge, and it was pointedly planned for Friday, not Saturday–the Yellow Vests’ demonstration day (the only free day for many of them, for example single parents, workers in offices and small businesses who don’t have strike pay or legal rights to strike). The Friday Dec. 14 union demonstrations were hardly imposing compared to Saturday’s Yellow Vest evens, so the ploy fizzled. People have been saying for more than two months that we must talk and find common demands. We have them. There is no reason we shouldn’t march side by side, the ones behind the others. What is important is to have a successful first day of action together, because I find that the bosses have been let off easy [by the Yellow Vests–Ed.] and it is time to bring to account the big bosses of this country. Martinez remark about needing to attack the big bosses was both pointed and to the point. The Yellow Vests, given their broad and varied social composition, have naturally focused on the consumer issues they have in common as working folk struggling to make ends meet: high prices, unfair taxes and declining social services, directing their anger at the government, the media and the political elite. Their signs often denounce “capitalism,” but as a group they have no direct relationship with big industry and finance in whose interest Macron rules. Yet clearly, only with the active participation of France’s organized workers can this broad popular movement succeed–for example through an unlimited general strike with occupations of workplaces and public spaces as in 1968. System-change is definitely not on the agenda of Martinez and the other union bureaucrats, whose social status, like that of the members of the National Assembly, depends on their role as the official “representatives” of their constituents within the existing system. Given the pressure from below, Martinez has no choice but to play at “convergence” with the Yellow Vests today, but it is only to outmaneuver them and secure his official status as labor’s representatives. This is precisely what the Yellow Vests feared from the start when they founded their movement on autonomy–perhaps remembering the dismal role played by the CGT in ending the general strike and popular uprising that shook up the De Gaulle regime in 1968 (and whose 50th anniversary was being celebrated all over the media all last year). Today may be the beginning of Chapter Two of our movement. We must all converge! The investigative site Médiapart sent two reporters up to Commercy after the Assembly of Assemblies and filmed their conversations with a couple of dozen local Yellow Vests, giving us an intimate view of how this diverse group interacts and makes decisions–a long process of patience, respect, tolerance, and conscious self-education. They explain how each individual brings pieces of the truth from her/his knowledge and experience, from which a consensus is achieved. (Or not achieved, on subjects where they are not ready to decide and sweep under the rug until they are). As for Macron, his popularity hovering around 22% thanks to his regal pretentions, inflexible neo-liberal orthodoxy, methodical use of violence to suppress the expression of legitimate citizen grievances and criticism, and his contemptuous way of talking down to his angry subjects. This figure is slightly above the 18% of the 2017 Presidential vote he got on the first round, before being elected as the only alternative to “the fascist LePen.” Compare this with approval of the Yellow Vests, which stands at 77%. The French hate nothing worse than being talked down to and taken for jerks, and Macron is his own worst enemy, for example when he declared that the presumably lazy French had “lost the taste for effort”–when more than half of them are breaking their backs just to survive. And what a dirty trick is the so-called great national debate-in fact it’s just a government propaganda campaign that manipulates our desire to debate and decide! True democracy, as we practice it in our assemblies, in our roundabouts, is neither on television nor in the fake roundtables organized by Macron. We, the Yellow Vests, invite everyone to join us with their own means and abilities. We call for continuation of the acts of protest (act 12, against police violence at the police stations; acts 13, 14 …), to continue the occupations of the roundabouts and the economic blockades, to build a massive strike starting on February 5th. We call for committees to be formed at workplaces, at schools and everywhere else so that this strike can be built from the bottom up by the strikers themselves. Let’s take things into our own! Do not remain alone-join us! We urge all Yellow Vests to circulate this call. If as a group of Yellow Vests you agree, add your signature and send it to Commercy (assembledesassemblees@gmail.com). Do not hesitate to discuss and formulate proposals for the next “Assemblies of the Assemblies,” which we are preparing for right now. Down with Macron-power to the people, for the people and by the people!